A formal working group within CPIC, PharmGKB, PharmVar, and the PGRN was formed in 2018 to focus on the dissemination of resources available for pharmacogenetic implementation such as CPIC guidelines, PharmGKB, PGRN and PharmVar resources, and implementation strategies of pharmacogenetics. The goal of the CPIC Dissemination Working Group is to support the dissemination of these resources to clinicians by identifying opportunities to engage clinicians and payors and raise awareness of these resources. 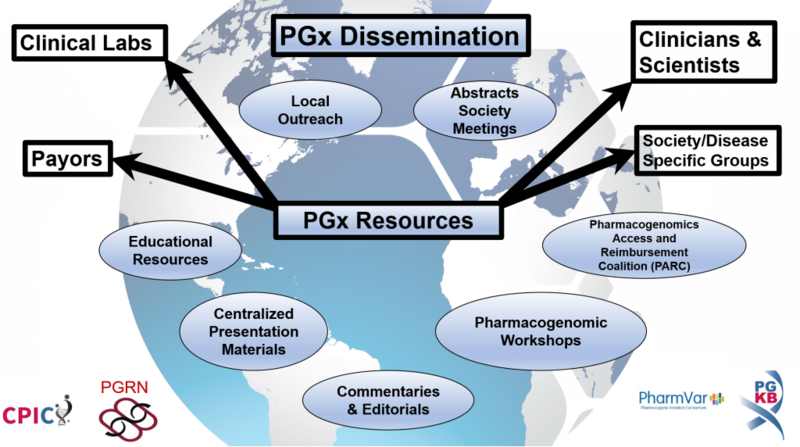 The PGx Dissemination Working Group is a subgroup within the CPIC. As such, the working group reports to CPIC leadership and provides regular updates during CPIC meetings. The working group co-leaders are Andrew Monte, M.D., Ph.D., University of Colorado Denver-Anschutz Medical Center, Daniel Mueller, M.D., Ph.D., University of Toronto and Andria Del Tredici, Ph.D., Millennium Health. The PGx Dissemination Working Group is open to any CPIC member, and all regular participants must be members of CPIC. As such, all working group members must abide by the CPIC Memorandum of Understanding.